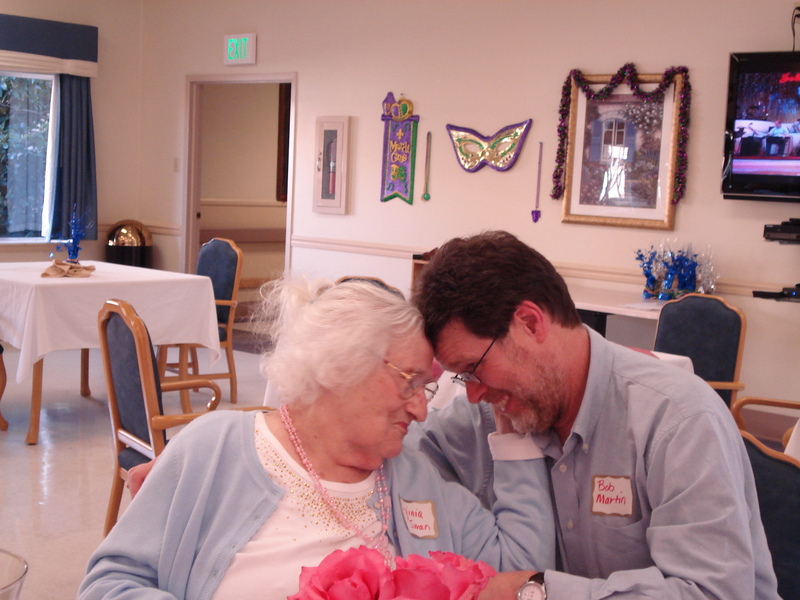 Home > Faith Matters, Humor	> Happy 103rd Birthday, Gramma! How do I know that my youth is all spent? Well, my get up and go has got up and went. But in spite of it all I am able to grin. When I think of the places my get up has been. Old age is golden, So I’ve heard said. But sometimes I wonder, as I get into bed. With my ears in a drawer, my teeth in a cup, and my eyes on the table until I wake up. When I was a young thing my slippers were red, I could kick my heels as high as my head. Then when I was older, my slippers were blue, but still I could walk the whole day through. Now I’m still older, my slippers are black. I walk to the store and puff my way back. The reason I know my youth is all spent, my get up and go has got up and went. But really, I don’t mind when I think with a grin, of all the grand places my get up has been. Since I have retired from life’s competition, I busy myself with complete repetition. If my name is missing I know I’m not dead, so I eat a good breakfast and go back to bed. It is always such a joy and delight whenever I visit you and I regret not being able to help celebrate your 103rd birthday. There are so many fond memories of good times spent together. To me, you’re the epitome of graciousness and a gentle spirit. You’re always pleasant to be around. There couldn’t have been a better grandmother in the world. Even though the eyes don’t see as well, and the ears don’t hear as well, and the fingers aren’t as dexterous, your mind is just as sharp today as it was 50 years ago. Back then – it’s a pleasant place for me to go where we’d sit on the front porch and watch the trolley cars go by. And you’d let me ‘help’ you push the lawn mower in the back yard. I once stepped on a bee and you had the best medicine – a Popsicle! We’d walk to the park and you’d give great big pushes on the swings and dig deep tunnels with us in the sandbox. Getting dirty was never a problem. A bouquet of dandelions always delighted you. You liked it when we’d ‘help’ in the kitchen and so you’d pull up a chair next to the counter. My favorite jobs, of course, were cracking the eggs and licking the batter off of the beaters. You’d climb up onto the top bunk bed and read us stories. Upon hearing the doctor’s advice to limit yourself to two beers a day, I still laugh at your decision to go from 12oz to 16oz cans! You taught me about honesty when, after having sent me to the grocery store to buy pancake batter, I (somehow) managed to not come home with the correct amount of change. You knew right away that I had ‘pilfered’ the cash and bought candy for myself. And too, you weren’t too pleased when you discovered me in the basement using matches as ‘indicator lights’ on my Tonka Toys. Even so, it was always comfortable to have you around. I always knew that you loved us. You still give us great big ‘bear hugs’ and squeeze us hard. I love it. I love you. And I look forward to seeing you again soon. All the very best on your 103rd, Gramma. Wanted: My Definition of Calvinism Humility – Is There an Easy Way to Learn It?